I've spent hours trudging along behind Jeff and Paul as they harvest junkyards. While they're digging through cars for the bits and bobs to help keep our and our customers' cars going, I usually stop and sit in a Volvo wagon here or crawl through the hatch of a locked Saab c900 to pay my respects. And sometimes, as we're walking along, we find the same model car that lives in our own herd. The guys see it as a bonanza and set to work plucking such critical items as ECUs, shifter surrounds, headlight switches and that damn chrome trim piece that runs along the top of an Audi 200 avant grille that always flies off and leaves the car looking rougher that it actually is. I understand their enthusiasm, but I do more of a pause. This is what my car will look like when it's dead. This is how easily the plastic interior panels will crack and yield to reveal the ECU, that's how the leather will look when rain and mold have taken over. This is how elderly it will appear when someone has taken the headlights from their sockets or how just excising the speedo cluster from the dash is like erasing its memory. All those miles driven? Gone, even more so now that most cars count them electronically. So, as the guys find the story of why the car has come to rest in the yard in the engine compartment, I leaf through left behind manuals with first owner's names carefully written in and service interval pages stamped. Someone, somewhere, sometime drove this broken shell off a lot new. Maybe they had trouble finding the headlight switch the first time or marveled at the weather band button on the radio or the two-tone horn switch. It's possible they even chuckled at how the salesman explained the use of the now highly mysterious button with a highway bridge overpass depicted on it. This week, a car one of our friends had modded and driven like it was stolen took its final trip. 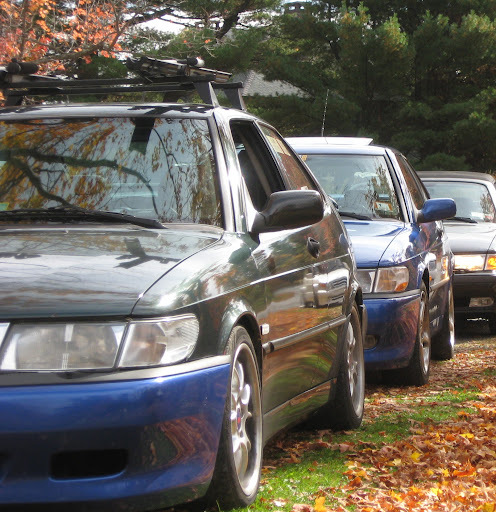 Oh Enduro, you mysterious three-door Saab NG900 with a blow off valve providing an exhaust-fueled exclamation point every fall when we gathered to romp along NEPA's winding roads. You were never ashamed to leave the house partially dressed - front bumpers are for pussies - and rightfully so since deeper than they seemed puddles shattered at least one prized Viggen part. You ferried me to parts stores when my own car needed a belt transplant and, a year later, to a wedding, serving as a rolling dressing room and hair salon. And, later that night, your sport suspension pulverized my bladder to the point where behind the dumpster of a shuttered Cumberland Farms was as good a place of any to hitch up my party dress. Years of life in central New York and the desire to drive something a little more modern came to an end at a Virginia junk yard with it being rolled like a ball of play dough. But let's not linger on those terrible last moments of Swedish steel being turned to scrap and go for one last ride. It’s a shame this car went, but I must say, it’s time had come. Cept that 9000 is in the pile now too.